Home > Blog > How to check redirects? Update: since version 2.0.11 Hextrakt provides a redirects report in "Directives" reports. 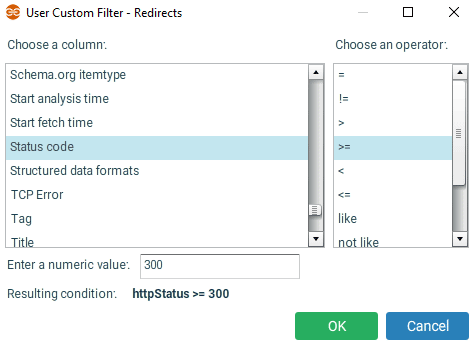 You may still read this post to learn how to make your own custom redirects report. As time goes by, redirects may accumulate on a website. When creating permanent (301) redirects, links that pointed to the old page should be corrected so that they point to the new one (the target of the 301), in order to keep a clean internal linking; this is even more essential if you work on a big website. In an ideal world wide web, you shouldn't find 301 redirects when you crawl a clean website. You may also want to review 302 (or 307) temporary redirects to check if they still are relevant. Let's see how to get a custom report of redirected (3xx status code) URLs of a website. Currently Hextrakt does not provide a redirects report, but you can quickly and easily create your own custom report and reuse it in other projects. By the way you should get used to create useful custom reports to analyze the data you need. 1. 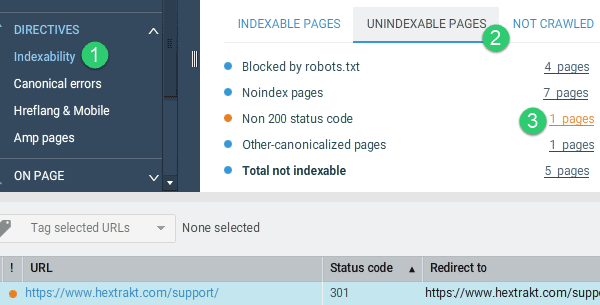 Go to Directives > Indexability > Unindexable pages > Non 200 status code. 2. Create a new custom report (with a custom filter): click on "Advanced URL explorer" > "New". 3. 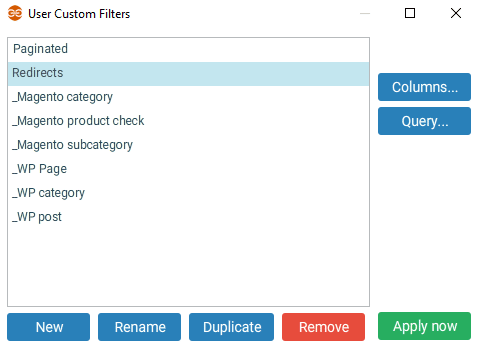 Name your custom filter "Redirects" and click "OK". 4. [Optional] If you want other columns to be displayed, click "Columns". 5. Click "Query" > "Add". For all redirects you can use 2 queries: status code >= 300 AND status code < 400). If you want only 301: status code = 301 (in this case name your custom filter "301 redirects"). You have now a custom redirects report that you can use in all your projects. To access your custom reports, click on "Advanced URL explorer".